SAVE A STACK THIS SEPTEMBER AT GLENBURN LODGE. LESS 25% ON YEAR END AND OTHER FUNCTIONS! I love a freeby as much as the next guy, but if someone tells me I can get 25% discount on the function I am planning, I am truly happy. So if you are in the middle of planning the year end party, your sister’s kiddo needs to be baptised, your parents are having their 50th wedding anniversary, best you stop by Glenburn Lodge. 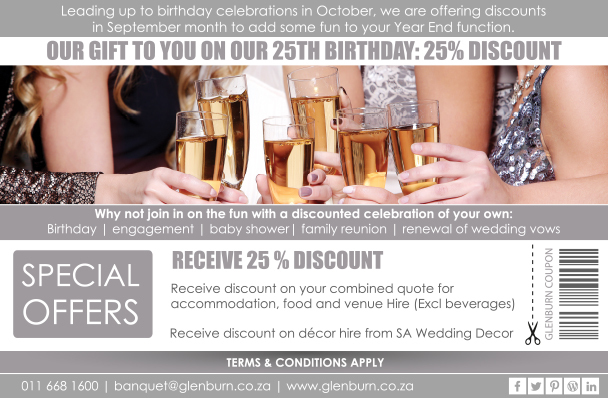 As they turn 25 this year they are spreading the joy with a 25% discount on all banqueting funtions in September. T&C’s apply and more info is available from www.glenburn.co.za or by calling Lee-Ann on Tel 011 668 1600.